What’s in a title? An in-game title can be a glamorous advertisement of objectively determined skill — as with The Proven Healer or Battlemaster. Or it can be an indicator of how one enjoys spending their time: Loremaster, Professor, Bloodsail Admiral (each of which is likely to be an indication of a masochistic personality). Pursuing a special title is a completely optional exercise, and yet I think many players have a special affinity for a moniker that has struck a chord with how they view their character. Hey there, I was just wondering how you leveled your Resto Druid in Legion. I feel like a lot of people say choosing a DPS spec is totally viable because of the way artifacts work but at the same time it kind of [frustrates me] to keep on changing between raids/dungeons and [World Quests]. What do you recommend? Note that the [nodead] modifier helps to ensure you’re not happily nuking away at a corpse. The final [@target] modifier may seem redundant but ensures that your spell displays the correct icon, even if you don’t have an enemy targeted. When one of your Restoration heal over time effects heals a target below 35% health, its duration is refreshed. The 7.2 changes and additions to Artifact Traits will have a lot of impact on classes, and so we’d like to keep core functionality relatively stable. We just made a very significant amount of changes to most specs in 7.1.5, and don’t want to pile another heap of changes on the community just yet. Raising the percent cutoff of the proposed ability from 35% to 50%. Making each cast of Rejuvenation progressively cost less mana (to a point). I encourage you to share your thoughts on that thread (and also here because that would be awesome) in the hopes of an improvement (or replacement). Deep Rooted (Rank 1): Your Heal over Time effects automatically refresh when their target goes below 35% maximum health. This seems pretty similar to Cultivation. I suppose this would be useful in cases where you need to ignore your tank in favor of raid healing? Joy of Spring (Rank 1): Efflorescence’s healing increases by 0% every 2 sec. Presumably, this won’t be 0% in actuality. Eternal Restoration (Rank 1): Increases the duration of Essence of G’hanir by 1 sec (up to 8 additional seconds at Rank 8). Depending upon the eventual strength of Joy of Spring, this is probably going to be my favorite of the three new abilities. Infinite (Rank 1): Placeholder ability. The full list of additional ranks — and speculation about what these changes may mean in terms of artifact progression — after the break. 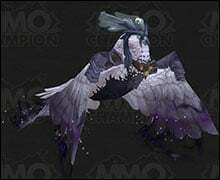 In addition to giving players the ability to unlock flight in the Broken Isles, Blizzard has announced that they will be adding class-specific mounts in Patch 7.2. Because the utility of our Travel Form is unmatched, the Druid “mount” will be an update to our epic flight form. Thanks to the ever-diligent MMO Champion, you can preview each our new owlish form in each of the four Druidic races: Night Elf (purple), Tauren (brown), Troll (red), or Worgen (black). I understand why Blizzard decided to create an updated model for our Travel Form, but I have to admit that I’m a smidge jealous of the gorgeous mounts that the Monk and Paladin classes will be getting! Personally, I would love a quest for Druids to befriend a Wild Dreamrunner. I’ve seen Hunters asking to tame these creatures, but I prefer to think that unicorns would only agree to accompany someone equally attuned with nature. Phoebe Phaelia and her Unicorn. I buy bottle service with my rent money. I’m grateful that Blizzard made the effort to be more inclusive, but some enterprising model designer really ought to grab a bedazzler and fix this!